Lou Fields (CDR, US Navy (Retd.)) died yesterday (see John's thoughtful Memento Mori on Lou). This is sad news — Lou was a welcome, wise, drily-funny, respected, and much liked presence around Oakland's North Field and elsewhere. Lou served in the Pacific during World War II, then stayed in the navy for a couple of decades afterwards, flying everything from Corsairs to jets off carriers, retiring as a (full) Commander in 1969. He later ran Lou Fields Aviation out of a trailer at Oakland's Old T's, where, as well as being an instructor, he was also an FAA Designated Examiner (DE, aka DPE). Lou was one of my mentors when I was learning to fly, and for a long time afterwards, as well. 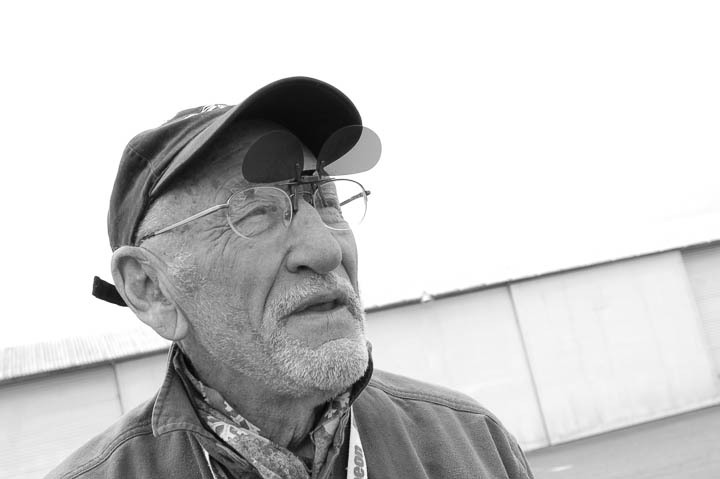 He often had interesting and sometimes sharp things to say about the way instructors taught, about things like GPS (he could be surprisingly enthusiastic about — and adept with — new technology), and things like the wisdom (or lack of it) of tailwheel training. He took an interest in my learning aerobatics with Ben Freelove, and had a lot of advice on aerobatic technique and instruction (he also used to threaten to take me up in his Pitts and teach me some "real aerobatics", but that never happened, unfortunately). He let me rent his old Arrow, 29J, after a thirty minute sign-off flight to Hayward and back in appalling weather, during which he mostly just talked about Australia, while occasionally giving me terse advice on my crosswind landing technique or telling me a few tricks about descent planning in 29J, etc. Lou would have been my instrument rating DE if he hadn't got an extended bout of illness back then. He was always joshing me good-naturedly about being both an "Aussie" (he pronounced it the Australia way) and a "Brit", and always asked about how things were going with me whenever he saw me around the airport. An all-round good guy, easy to talk with, amusing and knowledgeable about almost any subject, and one of those seasoned old warriors who'd come to believe that peace was always a wiser choice than war. He once told me he'd make a more effective fighter now than when he was younger — not so distracted by trying to stay alive nowadays, much more willing to take stupid risks now, as he put it. Lou will be sorely and sadly missed.